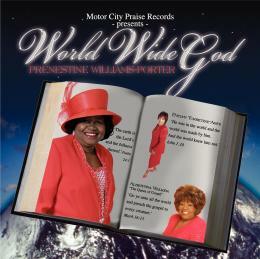 It's a royalty double-play as Albertina Walker (Queen of Gospel) and Evelyn Turrentine-Agee (Queen of Quartet) join forces with (relative ) newcomer Prenestine Williams-Porter to deliver the traditional hit, "World Wide God". The song appears on Williams-Porter's debut release from Motor City Praise Records, and the name is quite appropriate to the Detroit native, for she has brought her song to the nations, including Haiti, Italy, Israel and various island nations in the Carribean. "Brand New Blessing" is another seat-emptyer for you cannot resist rising to your feet to join in the praise, as Williams-Porter pours her alto into this praise cut, with some nicely rendered backing vocals. Production crew Profinitee (Curtis Turrentine Jr., Edward Armstead III) brings a church groove here and throughout the album that cannot be denied, with Joseph Otis holding things down on drums. On "I Will Do A New Thing", Williams-Porter (who also teaches music for the Detroit Board of Education), showcases impeccable phrasing and an ability to work the melody-line into maximum lyrical impact. Using just the right touch of vibrato and melismatic turns, she emphasizes the song's message while maximizing musicality. "I Can't Forget", penned by Williams-Porter, and the re-do of the favorite, "Walk With Me" are in the same vein. The tempo is turned down a couple notches on "I Know Someone", as Williams-Porter takes the ballad to testify of Jesus' faithfulness. The song takes a decidedly jazzy turn towards the end. Other songs to note are the remake of the Babbie Mason hit, "God Is Good" and "I'm Going Home", penned by Williams-Porter. The power of World Wide God is clear at first listen. Definitely not one to sleep on. All content in GospelFlava © 2006. No information to be reprinted or re-broadcast from this site without the expressed written consent of GospelFlava.com. All rights reserved.